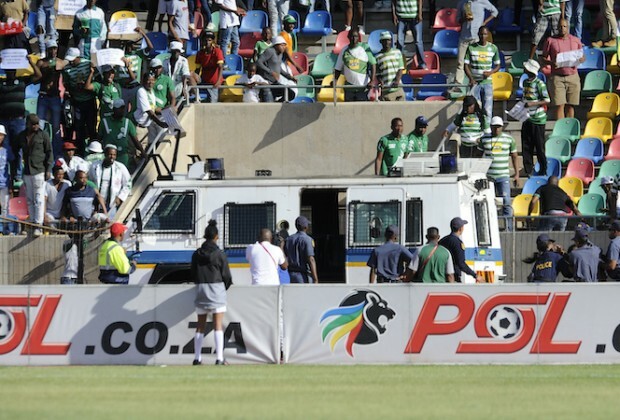 The South African Police Service have confirmed that 10 people have been arrested with regards to the violence at Bloemfontein Celtic’s stadium, including a 59-year-old woman. There were very unsavoury scenes at Dr. Molemela Stadium over the weekend as Celtic supporters reportedly protested against the club’s management, a protest that led to violence and ultimately the cancelling of the game against Cape Town City. It has since been confirmed by the Premier Soccer League that Siwelele have been charged with ‘failure to provide adequate security for the match and bringing the League‚ sponsors Absa‚ SAFA‚ CAF and FIFA into disrepute’, and Constable Mahlomola Kareli has explained that 10 supporters will be appear in court tomorrow. Kareli told the crew, “The violence went on for just an hour and a half, and our members managed to handle the situation and get things under control. We arrested 10 people in total, nine male and one female, aged between 26 and 59-years-old. They will be appearing tomorrow, and are facing charges as part of the Safety at Sports and Recreational Events Act (SASREA). The game was called off after just 23 minutes following the pitch invasion and throwing of objects onto the field, and it has been revealed that Celtic will appear before the PSL’s Disciplinary Committee on April 25. Celtics are slowly but surely walking the Swallos route?? So CTC will get a free 3 points and 3 goals.